Welcome to my new neighbourhood! I hadn't really explored it yet, much beyond the walk between work and my apartment, so last weekend I decided to get out and about a bit more. Technically my address is Jungang-dong, but Nampo-dong is just the next one over, and where work is. It's in the south of Busan, next to the ocean and there's a harbour and lots of fishing boats around. It takes about 20 minutes to get to Seomyeon, the city centre, on the subway, so it's pretty well located I think. My specific street is pretty quiet, just lots of apartments and local shops (naturally I can't understand a word of anything anywhere! ), and it's raised up above the lower street level on the hillside, so I can access it by steps up the hillside (I have to go up 6 flights in total to reach my floor). The streets below are a bit more interesting, with lots of cafes and restaurants mostly, but they're also lined with trees and there's statues of some sort at nearly every junction, which makes the walk to work a little more interesting. 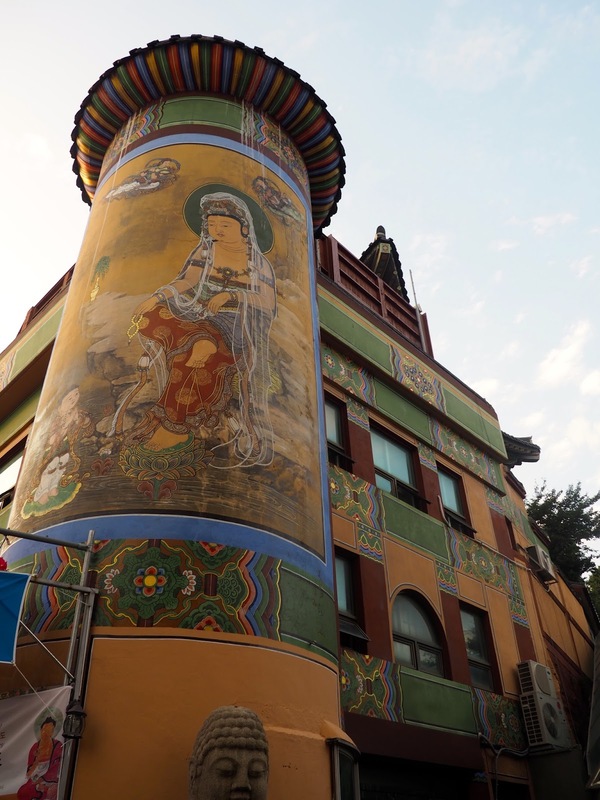 As well as the statues, there's also quite a bit of street art around, mostly tucked on random building corners and walls; it took me a few days of walking to work to notice all of it, since I was mostly focussing on not getting lost at first! My adventuring at the weekend first took me to Bosu-dong book alley, which is sort of halfway between my apartment and the main part of Nampo-dong. I took a bit of a detour to find it, but I was curious about anything known as "book alley". It would have been a bit more exciting if more of the books were in English - my excitement is naturally limited when I can't understand the books in question! - but it was still very impressive seeing them all stacked up like that! 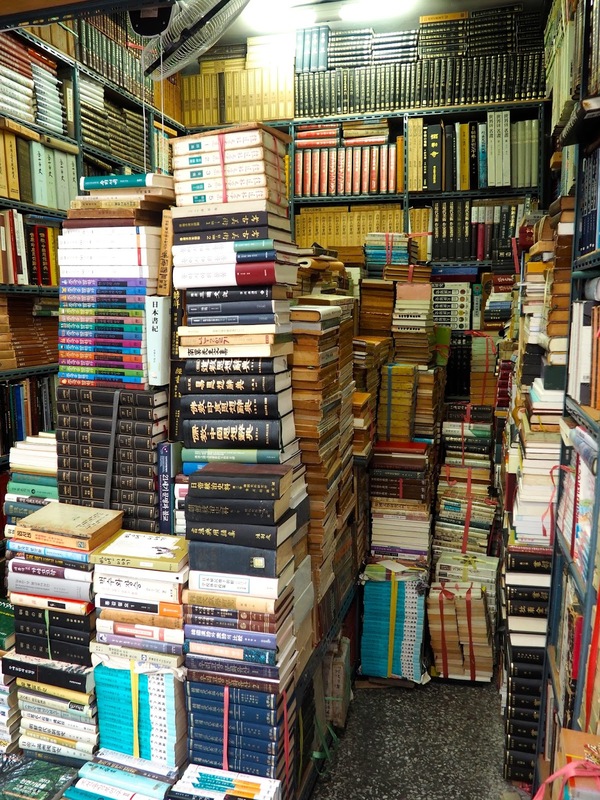 It was literally what it sounds like, a narrow street with nothing but book shops all the way along it, many of which were tiny establishments themselves, with even less room to move around considering they were crammed with as many books as possible, in teetering stacks all around you. I didn't buy anything, as the only English books I found were about grammar and learning the language - no thanks, I do enough of that stuff at work - but it was an interesting stop. 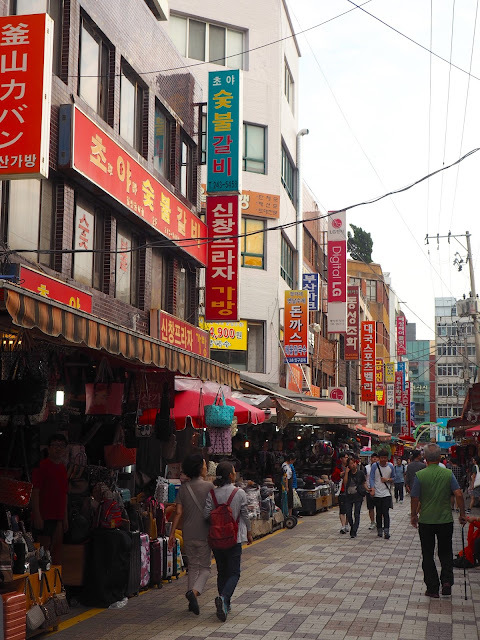 The main streets of Nampo, just next to the market streets, are devoted to more shopping, but this time of the larger store variety, with many recognisable brands around. It's a nice district just to wander through as well, as there's little traffic (the busier main road is a street over), and more statues and installations to have a look at, though many of these statues are painted in bright gold. Also around here is Piff Square, which is where the Busan Film Festival takes place every year. I'm told many film stars will be around for that too, so it could be interesting to see of I know any of them, when it happens next month. There's also plenty happening on the streets themselves too, as outside Piff Square there's a whole road full of street food stalls. Street food can be a bit tricky here when you don't know the language, so the only time I've had it so far was while I was with someone who does speak Korean, and that was in Seomyeon, but these stalls certainly smelled good! Also as I was wandering about, I took another detour when I spotted a sign that read "Art Alley". I had no idea what this was going to entail, but I thought I'd investigate, and was happily surprised to discover a back alley (it had a couple of restaurants along it, but not much else) full of street art! Each painting was individually done and took up its own chunk of wall - not like overlapping graffiti or anything - and mostly seemed to be themed around the area, as many depicted streets of shops, or the Busan Tower which stands over everything (more on that one in a minute). I was so surprised to have stumbled upon something like this, as I'd never come across anything about it when looking at Nampo online, and the sign for it was pretty small, but it was definitely a good idea to have followed it! From the shopping district, I headed down towards the harbour, where I could see out to the ocean, and the surrounding islands and peninsulas. Busan is coastal, but there's still land all around, connected by bridges, such as the island of Yeongo-du off the coast to the south, and Amnan-dong's peninsula to the west, which are connected by the Namhangdaeyo bridge, visible across the water from Nampo-dong. To the west is also Gamcheon cultural village, a mass of coloured houses on the hillside, which is definitely on my list of places to visit. My final destination of the day was to scale the hill overlooking Nampo-dong - using an escalator, there was minimal physical effort involved really! 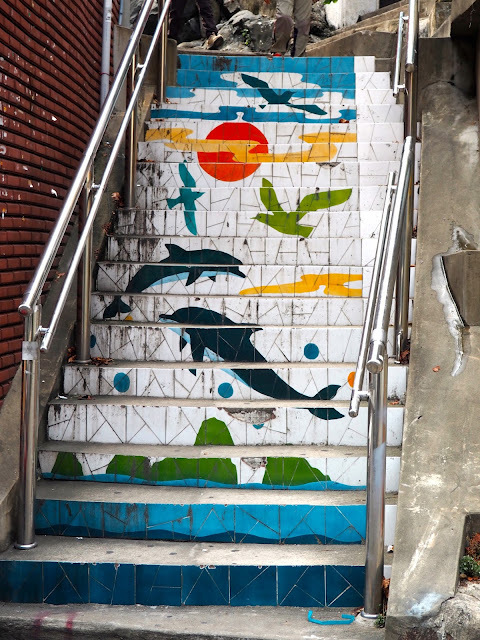 - to visit Yongdusan Park. It's best known for Busan Tower in the middle, standing 118m high. There's a few other things to see in the park though, or you can just take some time to relax here. The Citizen's bell is pretty impressive, and next to it is an exhibition area, where traditional performances are sometimes held. By pure chance, there was one happening when I arrived, which was a taekwando group performance. Some of the performers were just kids, but what they could do was very impressive, with lots of backflips and breaking boards! The park also has statues and pavilions, and some small museum exhibitions, but they were already closed as I got up here quite late in the day, after 6pm. Around the base of the Busan Tower there are what I was initially going to call love locks, but they aren't actually padlocks. 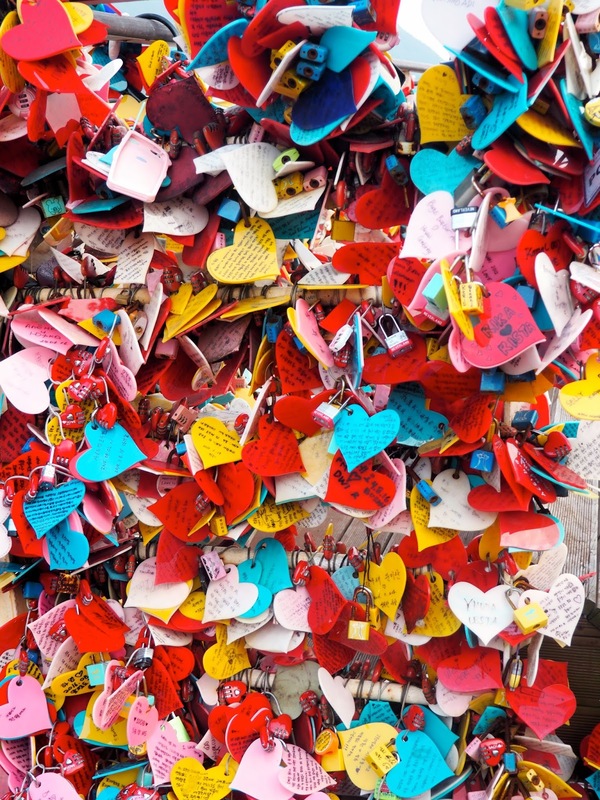 They seem to be the same idea though, but these are plastic hearts that couples write on, and then affix to the fencing surrounding the area. There's even a bench with a heart around it, which naturally couples race towards, and I later discovered that it even lights up at night! Finally, there is Busan Tower itself, offering a spectacular view over the city. I was looking forward to something like this, as I was yet to come across anything that rivalled the city views of Hong Kong. And while this doesn't come anywhere close to the Victoria Harbour skyline, it was the best view of Busan I've had so far. The lift whisks you up to the top two levels, the lower being a cafe, and the upper an observatory, although the view is pretty much the same from both. I took a walk around the top deck first, capturing my photos of the view - I was most impressed that you can see Gwangan Bridge from here - and then sat in the cafe area for a while. Since I'd come up quite late in the da,y I'd figured I'd get the most out of my ticket and wait for the sunset to see the view by night as well. The bridge is much prettier by night, when it lights up in different colours, and the Lotte Mall in Nampo (where I work) also looks quite nice with its colourful display. It was quite nice to just sit up there for a while, especially as I can be guilty of whizzing round sights a bit fast, and the view was even more impressive by night. Initially I was unconvinced about the area I'm living in, as it seemed so quiet on my walks to work. And while that's still true of my street, and the route I take to work, I'm much happier to have discovered what else is around me. The main part of Nampo-dong is much more interesting with the shops and markets, and I'm intrigued by the prospect of the upcoming film festival. Having a park nearby like Yongdusan is good too, and there's also Democracy Park, just up the road in the other direction from my apartment, which I've still to check out. 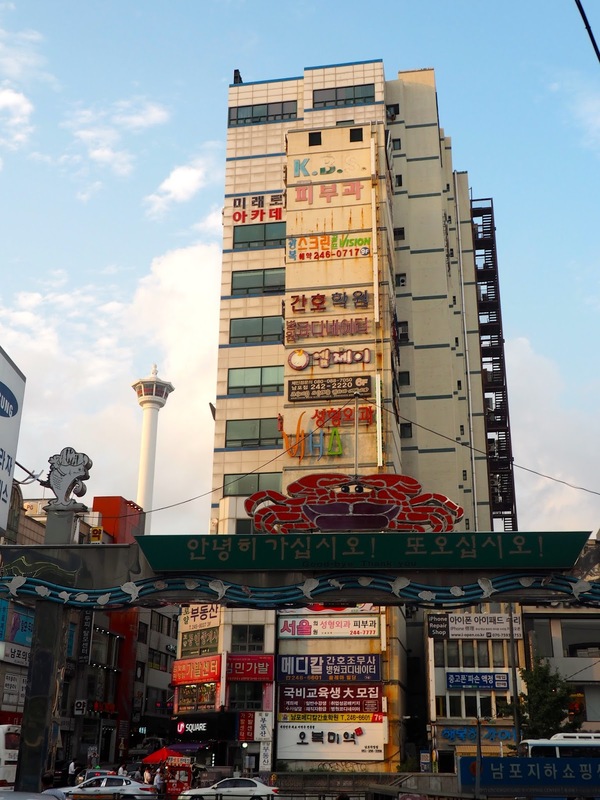 Being fairly close to the city centre provides easy access to anything I can't find in Nampo too, and of course, this is just one area - there's still the rest of Busan to be explored. 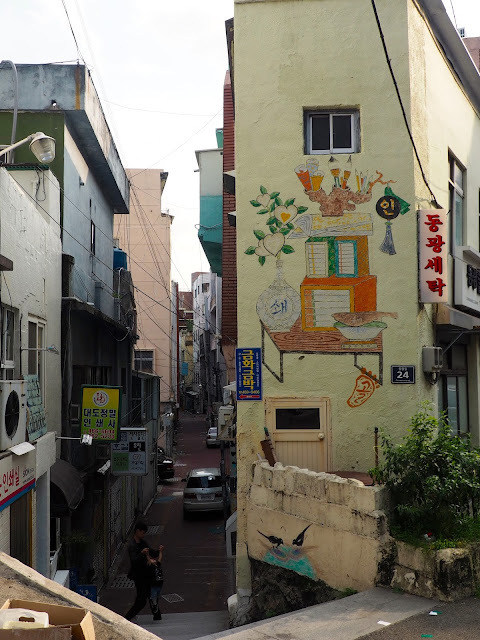 If you're interested in visiting and exploring Busan yourself, you may want to consider the Busan 1 Day Small Group City Tour from Trazy Crew, which includes Gukje Market. I did not do this tour myself, but am an affiliate and would receive commission from bookings.